This spring/summer we did some work on our back porch – basically the paint color went from a dark hunter green to a much lighter and brighter pale gray with white trim. It really brightened up the space! I also purchased a rusty vintage glider and matching chairs and had them sandblasted and powder coated to a creamy white. We also brought my grandmother’s swing onto the back porch and I love it out there! You can read more about my vintage glider and chairs HERE. I love this space now and since the french doors in the dining room lead to the porch, I decided to decorate the area this year! 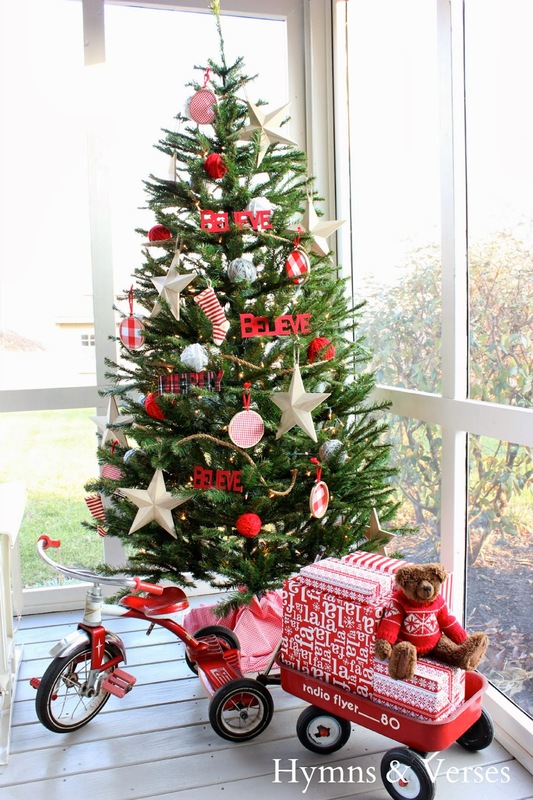 I used red and white to decorate the dining room for Christmas, so I decided to decorate the porch with red and white as well, but much more casual and fun! I brought in the red tricycle I rode when I was little and my boy’s radio flyer wagon. 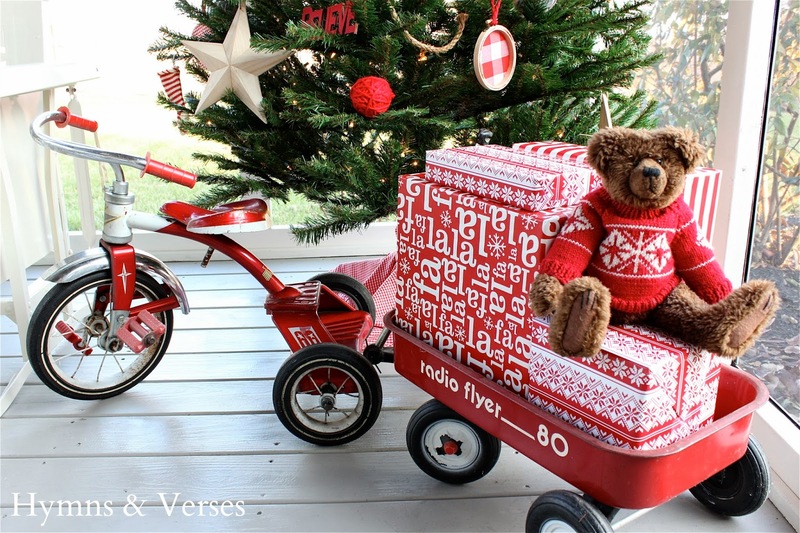 The wagon is filled with red and white packages and this teddy bear looks like he belongs in the wagon full of packages. Here’s a close-up of the tree. I decorated the tree with large wood stars that I got after Christmas last year at Michael’s, plaid and red “Merry and Believe” words from the dollar bin at Michael’s, a rustic rope garland, red and white striped knit mini stockings found at Christmas Tree Shoppes for $1 each, mini embroidery hoops with red check fabric, and yarn wrapped balls. 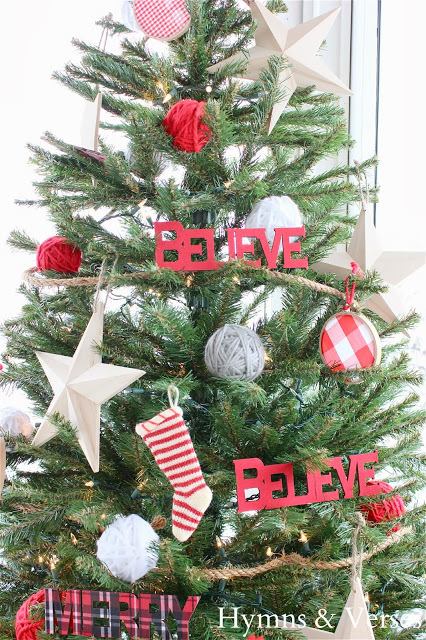 I little secret on how I saved some money on those yarn balls – I used a .97 bag full of gold glittered styrofoam ornaments found at Goodwill and wrapped those with the yarn. This was a major savings since a package of 6 styrofoam balls at the craft store is $4.99! 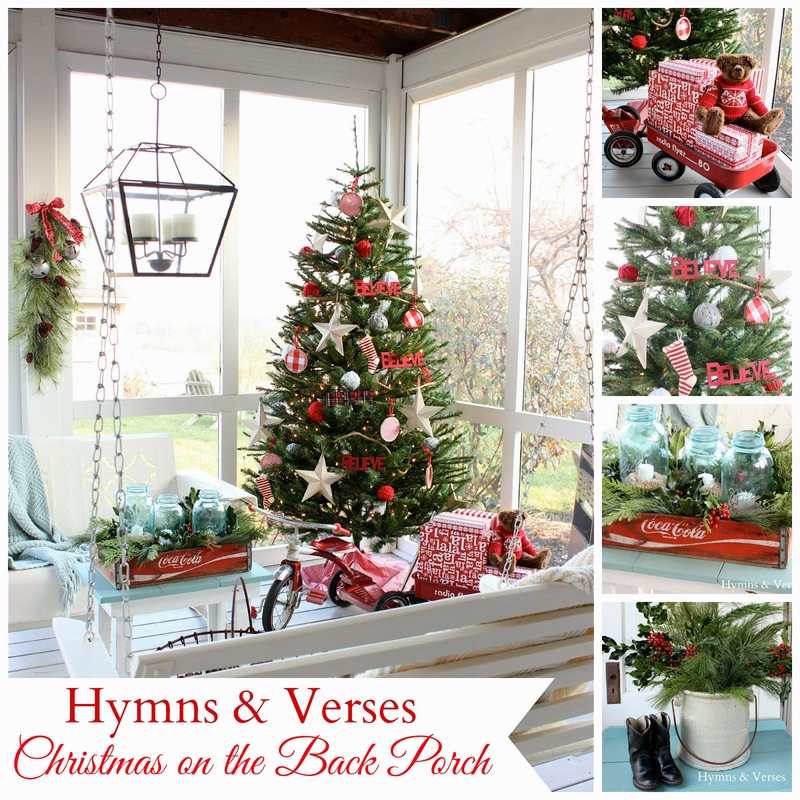 Here are a few of the other spaces decorated on the porch. 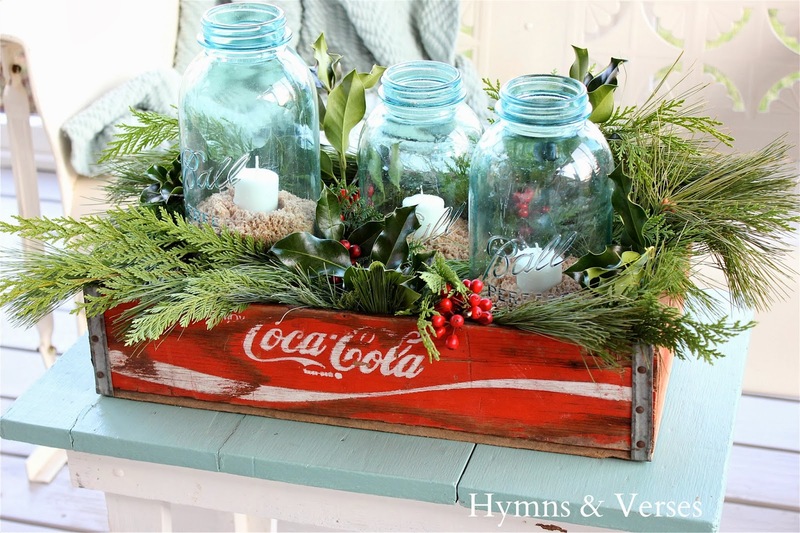 A vintage Coke crate with some vintage Ball jars and greens were the perfect touch for this little table! On Sunday we had a a mini photo shoot out their with Josh and Sarah – it was our first snow of the season and they were getting their engagement portraits taken! I was thrilled that Sarah wanted a few taken out on the porch! I can’t wait to see the final pictures – they were outside all day in the snow in different locations having pictures taken – when they finally came inside, their toes were white! 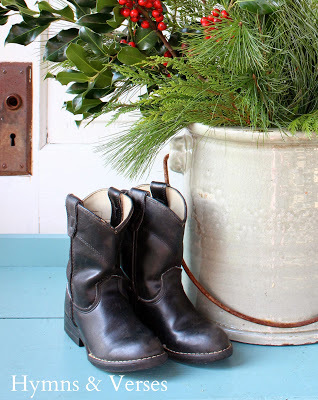 Thanks for stopping by today to see more of my back porch all ready for Christmas. 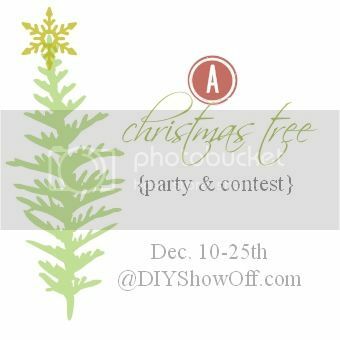 If you like my tree on the back porch, come over to the DIY Showoff where Roeshel is having a Christmas tree contest. 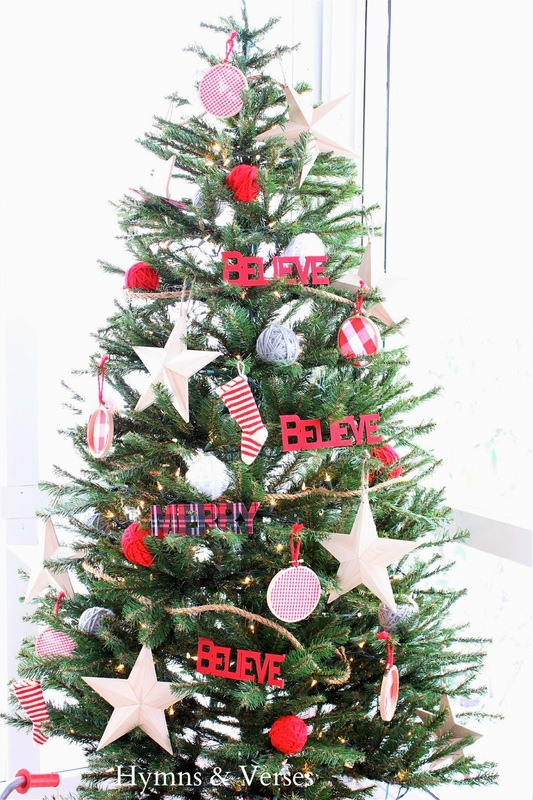 The tree with the most votes wins a $100 gift card – and I sure could use that for some upcoming projects in the New Year! My living room flocked tree is #15 and my back porch tree is #18! Just click the graphic below and it will take you to the contest page! Thanks a bunch! 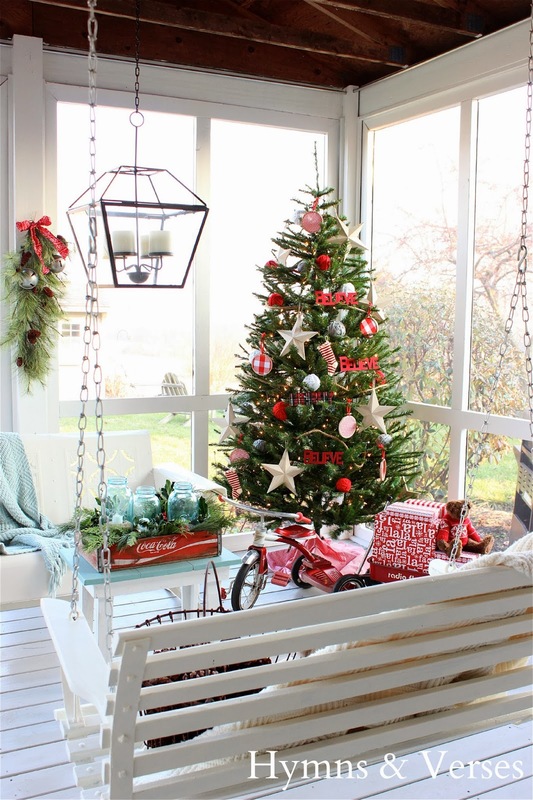 I love the Christmas decor and your beautiful sun room! your porch is just wonderful!! love all the great red, that coke crate is so fun, and I love that great lantern! Doreen this is just so cute. 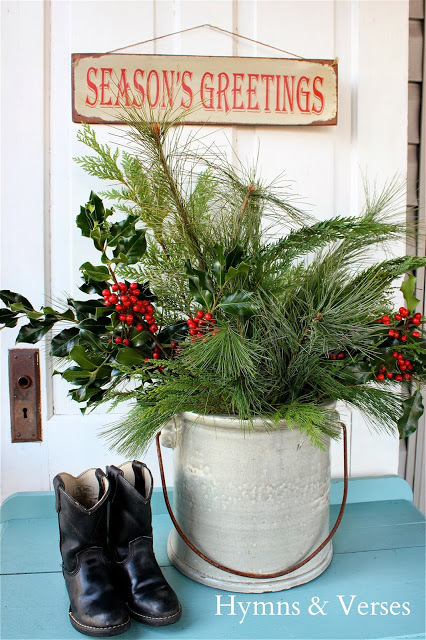 What a fun porch to decorate, and it looks so welcoming! So very pretty! I use my Coke crate in the summer, but you've given me a great way to use it at Christmas too! Thanks. Doreen, I absolutely love your back porch! And I've never really liked red, but you make me want to try red for Christmas next year! And how did you keep your trike so sparkly red? I had a red tricycle but don't have it anymore, but the memories are still there. I'll have to share them with you when I come up for some hot chocolate!